Dryck Bubble Paron Sparking Pear Drink 750ml, Yogood Strawberry Crunchy Muesli 350g, Classic Hazelnut & Almond Betty Fours 198g, Grandma Wild's (UK) Savoury Biscuit Selection 385g, Heavenly Traditional Pineapple Tarts 310g, Butler Grove's Ginger and Lemon Preserve 340g, Butler Grove's Seville Orange Marmalade with Ginger 340g, Traditional Kelantanese Serunding 108g and Dragonfly (UK) Cape Malay Chai (Organic Spiced Rooibos ) 40g. 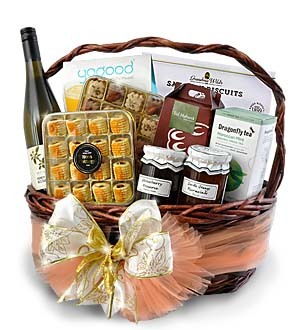 Festive goodies comes in a weaved Thyme Basket accessorized with ribbons. 24/7 delivery applies for order within Klang Valley(Kuala Lumpur, Petaling Jaya, Selangor, WP) only. For out of Klang Valley delivery, gift will be delivered via courier and at least 3 working days notice is required. Same day delivery applicable for order made before 12pm on the day. For customization, contact Pods & Petals Giftlab at +603-78830233 / +6012-6915200 or sales@gift-lab.com for enquiries.